Big week of firsts for E's JK class, this week. He had his first Christmas concert (other than the ramshackle rendition of Jingle Bells they did at daycare) and his class went skating. Both of these events were in the afternoon so we left work early to attend the concert, and then I took the afternoon off to go skating. Luckily I'm not very busy at work so it was easy to take the time. 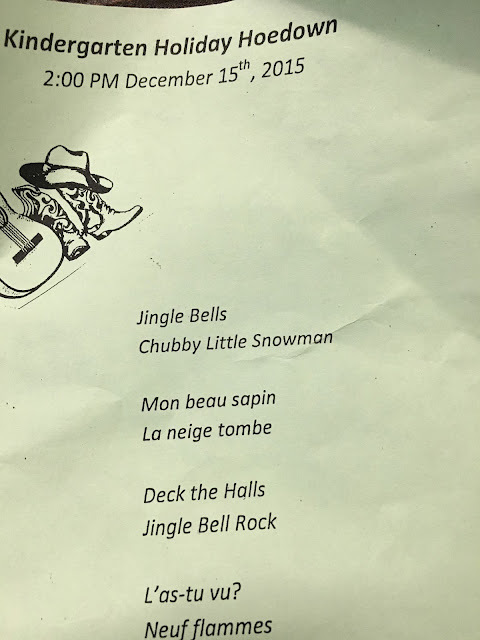 On Tuesday we got to the school about 40 minutes before the concert started, and a good thing we did because there was already a line up of parents to get into the gym. We were able to secure a front row seat. French songs by the SK kids, impressive. E's class sang Deck the Halls and Jingle Bell Rock. There is our little "cowboy"
He's playing a guitar here I think. It was a little chaotic but so cute. The kids were having a great time. I couldn't figure out how to make a suitable sized video that I could include in this post, I tried to create a little 10 second video that shows E's bow and big smile at the end of Deck the Halls. I think it comes through but is blurry; he's on the far right. The following day I met the kids and other parent volunteers at the Mastercard Centre in Etobicoke. The Leafs happened to be practicing there at the same time, but by the time I figured it out it was only the third and fourth liners out on the ice for extra drills; Babcock, Phaneuf, and the other boys were already back in the dressing room. Pretty cool though that our kids were going skating at the same place as the Leafs. So the kids arrived and I grabbed E and a friend of his and got them ready for skating. E had never gone skating before but he was still excited. Luckily his friend had taken lessons before so I didn't need to hold him up. A little girl brought over this little skating support which E really liked. It was too bad we didn't have one the whole time. He had a good time I think and is excited to try it again. I was exhausted when we were done. E got back on the bus to head to school and I went to Tim Horton's for a much needed coffee! Such great times! Nice that you got the front row seats so E could see you...even better he was in the front row so you could see him! Hope he gets skating again, he looked good with the support. So happy you could get off work to be there for both events.